Prime Minister Alexis Tsipras held a series of brief meetings with world leaders on the sidelines of the NATO summit in Brussels, which was held in the shadow of the terrorist attack in Britain. The Greek premier spoke at length with his Italian counterpart Paolo Gentiloni, German Chancellor Angela Merkel and French President Emmanuel Macron. 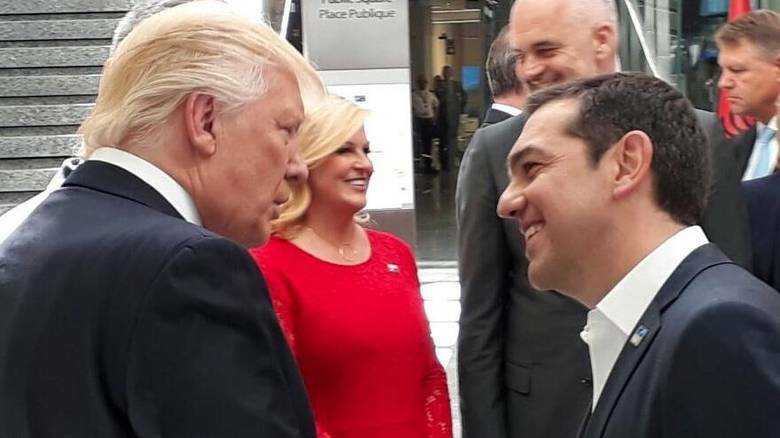 In a brief meeting with Tsipras shortly before the start of the summit meeting, U.S. President Donald Trump hailed Greece’s recovery is “amazing.” “You are recovering and this is amazing. Greece is a wonderful country with wonderful people,” he said. Earlier, Tsipras also held brief meetings with his Dutch counterpart Mark Rutte and Canada’s Justin Trudeau and spoke with Croatian President Kolinda Grabar-Kitarović. He then had an opportunity to express his condolences to British Prime Minister Theresa May for the terrorist attack in Manchester. During an earlier meeting with his Albanian counterpart Edi Rama, Tsipras said that Greece places great importance to stability in the western Balkans and the region’s European prospects. According to government sources, he stressed that nationalist practices and rhetoric in the wider region must be overcome in favor of democratic principles and the respect for international law. The Greek prime minister welcomed the resolution of the political crisis in Albania and the contribution made by all the political forces in the country in this direction. He voiced Greece’s strong support for the reform process in Albania and the importance of the Greek ethnic minority’s rights for Athens. According to the same sources, Tsipras and Rama both noted the historic, cultural and economic ties between Greece and Albania and said that Greek-Albanian relations were of a “strategic nature and importance.” Discussing bilateral ties, they expressed full support for an initiative by the foreign ministers in the two countries to set up an “intensive talks” mechanism in order to further improve relations.